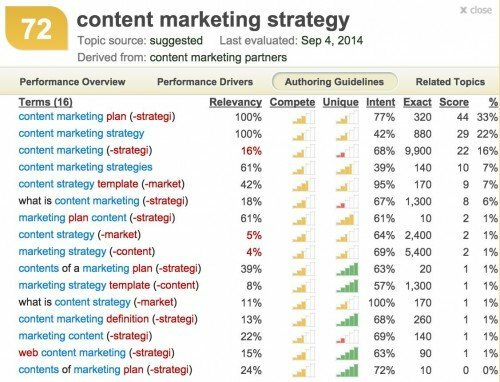 First, you need a content marketing strategy (I created a free framework about that right here). Second, you probably need more content. 70% of B2B content marketers created more content in 2014 than 2013, and that trend will not be abating. You need content to address each persona. Content to address each stage of the purchase funnel. Content to address each question at each of those stages. (I took a stab at figuring out for you how much content you need right here). But, the dirty secret of content marketing is that even when you’re trying to cover all of your topical bases, the truth is that a small minority of your content executions drive the overwhelming majority of your successes, especially with regards to website traffic coming from organic search. In reality, a lot of the content you produce (and we produce here at Convince & Convert) reaches a very small audience, while a few home runs drive most of the meaningful results. What you need is a way to help determine what’s going to be “breakout” content marketing BEFORE you create it, not after it’s made. For the past few months, my team and I have been working with Inbound Writer to do just that – give us a crystal ball on content marketing success – and the results have been remarkable. We’re believers in predictive content analytics. Here’s exactly how we did it, and the lessons we learned. 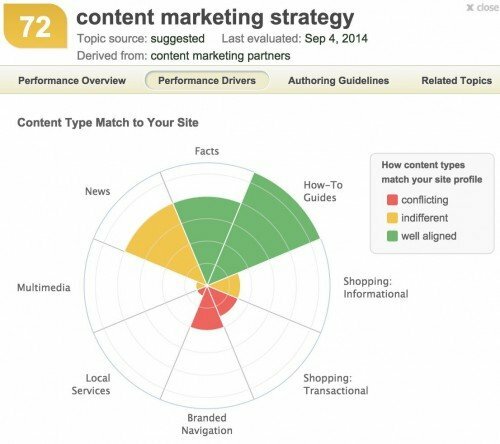 Hopefully, it will help you become a more efficient content marketer too. Inbound Writer helped us analyze the 242 posts we published here in 2013 and discovered that the top 25% (61 posts) generated a whopping 78% of the visits from organic search (and 67% of all visits). The bottom 50% – 121 articles that we spent a ton of time creating and editing – generated a paltry 7% of organic search visits, and 9% of total visits. That was a real eye-opener for me. Half of our investments in this site are not really paying off whatsoever. Next, we started using Inbound Writer to help select and refine some of the topics we write about here. Over approximately 90 days, we published 87 posts at Convince & Convert, and used the Inbound Writer technology on 18 of them, with 69 other posts serving as a control group. Here’s how that actually works, in practice. Inbound Writer’s software scans and studies your entire website to determine topical depth and breadth. 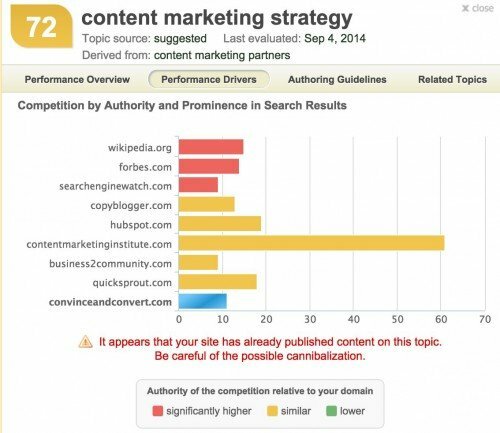 Then, the system helps you select winning content marketing topics. These recommendations are made using a point scale whereby performance predictions of ~92 points or more are “green”, scores of ~43 to 91 points are “yellow”, and scores of 42 or below are “red” and therefore not recommended for inclusion in your site. There are literally dozens of data points that comprise the Inbound Writer topic score. Among them are the appropriateness of the topic to what you’ve previously published; existing competition for the topic among other sites online; and known search engine volume. It even recommends what type of content you should create (how-to, multi-media, etc. ), and suggests whether the topic is important enough to be in your site navigation. Here’s how it looks inside the tool, using actual data for the topic “Content Marketing Strategy” which I used for a post + slides on that topic. Since publication, the 18 posts we created using the software accrued 8,134 visits from organic search. The other 69 posts we created without the software accrued 5,054 organic search visits combined. On average, topics created using Inbound Writer generated 4.4 times more organic search visits, and 2.2 times more total page views than posts published without the software. 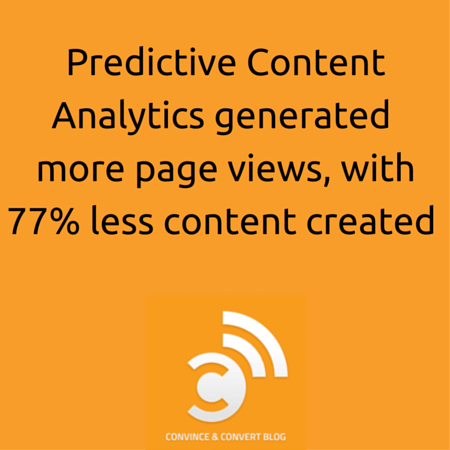 Overall, predictive content analytics generated more page views with 77% less content created. The results of this test are striking and important (at least to me), and they raise some key questions that we’ll be considering. First, ideas for posts are typically generated by me or our guest contributors, and then we sometimes used Inbound Writer during this test to help refine and modify those ideas to make them more viable. What if instead we used Inbound Writer to create a list of topic ideas from scratch, and then found the best people to write to those topics (which is really the ideal use case for the software)? What would be the impact of that approach? Potentially massive, I think, but would require us to change a lot of internal processes. Second, if we can generate a huge percentage of our overall site visits with fewer posts just by being smart about topics using predictive analytics, maybe we could actually reduce our publication frequency (currently 8 posts per week) with no effect on overall traffic. That would also have potentially massive (and positive) impacts on overall workload, but isn’t something we would jump into without some serious thought and study. Also recognize that Inbound Writer recommendations are based on the topic in question being the sole, focused phrase from a search engine perspective. That means the headline and URL of your content marketing execution would include that recommended topic, and nothing else. In practice, I find that to be a challenge because what will work best as a headline for social media and email does not necessarily work best for what Inbound Writer (and Google) want. Note too that Inbound Writer let us use their software for free as a test to see if it would have an impact on our site. They know I am writing a case study about it, but have not seen this post pre-publication. Inbound Writer license fees start at $200 per month for SMBs, and $500 per month for larger content organizations. If you’re looking to do more content marketing next year, maybe you could actually do more with LESS, using this type of predictive content analysis?